Lesya Ukrainka (1871-1913) is a celebrated literary figure. She was a top poet and writer among both females and males of her time, known as an activist for advancement in political, civil and woman’s rights. Lesya is an iconic figure to Ukrainians because she promoted Ukrainian literature, culture and language in a time when Ukrainians were heavily oppressed. During this time, it was dangerous to have an independent, strong voice of opposition to the Russian command. Lesya was, at one point, briefly arrested for translating the Communist Manifesto into Ukrainian and was then later placed under surveillance by the tsarist police. Lesya was ahead of her time in speaking out for women’s rights and had a brilliant patriotic heart and mind evident in all of her literary works. The University of Saskatchewan is proud to have Lesya Ukrainka’s 16 foot bronze statue on campus for her historical and literary impact. 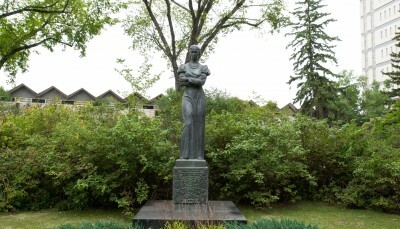 The Lesya statue was given as a gift commissioned by Association for Cultural Relations of USSR. With the acceptance of this gift came controversy. Some people saw the gift as an attempt to justify and dignify the injustices of the Soviets against the people of Ukraine. When the University did in fact accept the gift, there was public outcry followed by protests at the unveiling of Lesya Ukrainka’s statue in 1976. In 2012, construction of the new Aboriginal Students Center (ASC) started 30-40 feet away from the statues location, which was just south of the Arts Tower. Many in the Ukrainian community believed that the ASC would diminish the physical and symbolic prominence of the Lesya Ukrainka statue. On May 31st, 2013, to remedy these concerns, the Lesya statue was moved. The movement of the statue is part of Library Transformation, Phase 3 which is completely funded by library donors. There has been extensive planning to coordinate the move. The project of moving Lesya was endorsed by the Ukrainian Canadian Congress and Ukrainian Canadian Professional and Business Club. Donations came from Buyniak and the Winnipeg based Shevchenko Foundation. Lesya now rests in what is to be called the Lesya Ukrainka Garden by the main entrance of Murray Library facing the Arts Tower. This garden will help preserve Ukrainian heritage while creating a unique space for students, faculty and staff to engage with Ukrainian history. The opening of this garden also marks the centennial of Lesya’s death, raising awareness of who she was as a literary figure. This new resting site of the Lesya statue will be unveiled on August 1st, 2013, at 2:00pm followed by a reception.